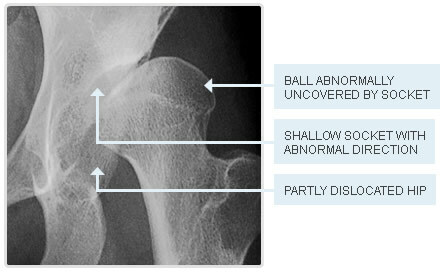 Acetabular dysplasia is a shallow and abnormally directed hip socket (see Figure). The condition is most commonly associated with a subtle abnormality of the hip joint at birth (congenital hip dislocation) and often remains undetected for many years. Sometimes acetabular dysplasia can develop as the result of other childhood hip conditions such as infection, trauma or Perthes disease. What are the consequences of acetabular dysplasia? Hip joints which are abnormally shallow are predisposed to progressive damage to the cartilage, leading to osteoarthritis. Acetabular dysplasia is one of the leading causes for the development of hip joint osteoarthritis, particularly in women. I've never had a painful hip before, why now? The hip does not become painful until enough damage has accumulated in the joint. The first symptoms are often mild groin discomfort. Once the joint becomes painful, gradual deterioration of the hip joint can reliably be predicted; however reducing your activity level may reduce the symptoms. Key concept: Acetabular dysplasia is a "spectrum"
It is useful to consider dysplasia as a disorder with graded severity, ranging from a very mild (borderline) deformity through to very severe joint irregularity. The outcome for dysplasia is significantly influenced by the amount of dysplasia present. Some patients with mild forms of dysplasia may indeed not develop arthritis into the future, or alternatively have outcomes very similar to patients who do not have dysplasia. For this reason, not all patients with dysplasia require corrective surgical treatment, particularly if only mild deformity is present. In this respect, rather than asking "do I have have dysplasia?" a much more practical question is to to ask "how much dysplasia is present?". How long will my hip joint last? This is sometimes a difficult question to answer. Once the hip becomes painful, acetabular dysplasia predictably causes progressive damage to the joint, but the progression can be very slow. Most patients experience ongoing discomfort which gradually worsens over many years, even decades. Patients with very shallow hip joint sockets who have developed symptoms around the age of 20 rarely get beyond their early to mid- thirties without requiring an artificial joint replacement. Why not just wait until I develop severe arthritis, then get an artificial joint replacement? This is certainly an option. Artificial joint replacements are a reliable and safe method of treating established osteoarthritis. As joint replacement technology improves we are seeing far more wear resistant bearing surfaces more suitable for use in younger people with hip osteoarthritis. Younger patients managed with artificial joint replacements however do have a much higher likelihood (over their whole lifespan) of requiring increasingly complex re-operations to revise failed artificial joint replacements. In selected patients with acetabular dysplasia, early corrective surgical intervention can slow or prevent the progression of joint damage and improve symptoms. 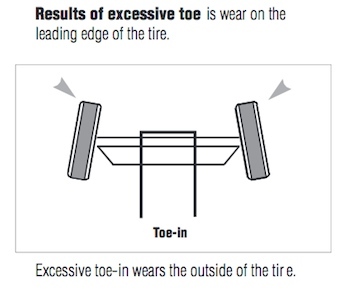 Figures 2 & 3: Mechanical malalignment causing premature wear. How acetabular dysplasia in the hip joint predisposes to hip joint arthritis can be understood by considering the examples above. 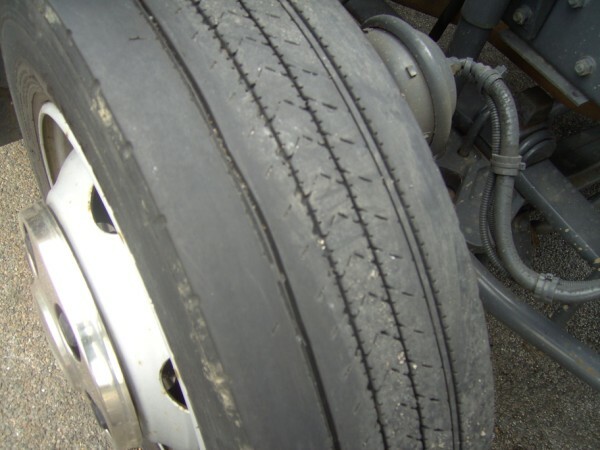 Excessive load placed upon one part of the tyre has resulted in one section wearing significantly in comparison to the relatively unloaded portion demonstrating minimal wear. In hip joint dysplasia, as the socket is abnormally shallow, excessive load is placed upon the cartilage of the socket edge resulting in premature wear in this section. Surgical procedures for the correction of dysplasia attempt to "realign" the joint, giving a larger surface area for load distribution and relieving "point load" from the acetabular rim. Once substantial cartilage wear has occured within the joint however, surgical correction becomes less effective - somewhat similar to realigning a wheel with worn tyres. It should also be apreciated that a realigned wheel will still experience tyre wear - corrective procedures for dysplasia may reduce but cannot eliminate the risk of developing osteoarthritis in the future. This information handout has been written by A/Prof Patrick Weinrauch for the purposes of patient education. The details provided are of general nature only and do not substitute for professional recommendations based an individual clinical assessment. © A/Prof Patrick Weinrauch. Brisbane Hip Clinic. 11/2015.